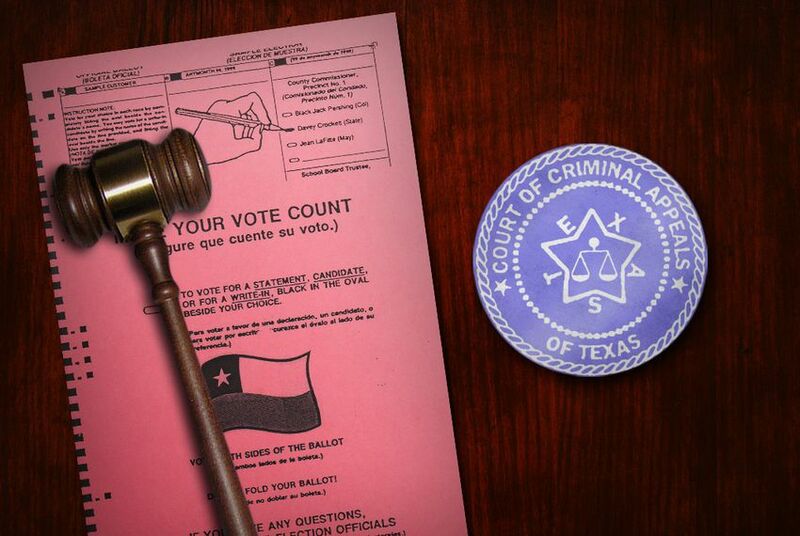 At least three members of Texas' highest criminal court will be replaced in the next year, and observers say the unusually high turnover could have a significant effect on the court's decisions. The nine elected judges on the Texas Court of Criminal Appeals make some of the state’s toughest decisions. They are the final arbiters of the state's criminal law, determining, among other things, if and when the state has the authority to take a person’s life. This year, three judges — Cathy Cochran, Tom Price and Paul Womack, all Republicans — opted not to seek re-election. A fourth judge, Lawrence Meyers, is running for a seat on the Texas Supreme Court; if successful, his spot will also be up for grabs. Observers say the unusually high turnover could have a significant effect on the court's decisions. And seven GOP candidates are vying for the opportunity to shape the court's future. In a recent example, Cochran, Price and Womack all joined in a September majority opinion that held that mentally ill death row inmate Steven Staley should not be forcibly medicated, and that without the medication he was incompetent for execution. The seven Republicans who are vying to replace the exiting judges will face off in March in three separate primary races. The winners will be automatic favorites in November’s general election. Just one will face a Democratic challenger. Three Libertarians and two Green Party candidates have also filed for November’s election. Brian Wice, a Houston-based defense lawyer who often appears before the Court of Criminal Appeals, said its current makeup tended to give prosecutors “at least a two-touchdown advantage” over defendants. “Given the fact that three judges who are winnable votes for the defense are leaving, the trio of judges who replace them will leave their mark on the court for a long, long time,” he said. “We’re willing to give whoever gets elected a chance to show us their philosophy,” he said. The Republican primary race for Place 4, vacated by Womack, drew three Republican contenders, the most of any seat. Jani Jo Wood, an attorney in the Harris County Public Defender’s Office for the past two years, has billed herself as a constitutional conservative with the most experience fighting “government overreach” on behalf of defendants. Richard Dean Davis, the third Republican candidate for Place 4, was unavailable for an interview. The winner of the Place 4 primary will face Quanah Parker, a Libertarian, and Judith Sanders-Castro, a Green Party candidate, in the general election. Walther drew national attention in 2008 when she presided over the trials of Warren Jeffs and several men in the polygamist sect of the Fundamentalist Church of Latter Day Saints at the Yearning for Zion ranch. Walther’s website touts her involvement, noting that Jeffs is serving a life sentence plus 20 years, and that the conviction was upheld by the Texas Court of Criminal Appeals. But the Texas Supreme Court upheld a ruling that Walther abused her discretion when she ordered that 416 children on the ranch be seized by Child Protective Services. “It was an area that had no precedent,” Gus Clemens, Walther’s campaign manager, said of the decision. Bert Richardson, who is also running for Place 3, has worked as a prosecutor and state district judge. He described himself as “conservative but impartial” compared with the outgoing judges, whom he said “are viewed as the moderates on the court.” He said he had won the support of both prosecutors and defense bar associations. The winner of the primary for Place 3 will face Democrat John Granberg and Libertarian Mark Bennett. Two Republicans are vying for Place 9, which is being vacated by Cochran. One contender, Bud Kirkendall, a district judge from Seguin and former district attorney, called Cochran “an outstanding judge” but said his own judicial outlook mirrors that of Clarence Thomas, the U.S. Supreme Court justice appointed by President George H. W. Bush. “You’re supposed to remember, you’re there as a check on legislative and governmental overreach,” Newell said of the judicial role. Kirkendall or Newell will face William Bryan Strange III, a Libertarian, and George Altgelt, a Green Party candidate, in the general election for Place 9. For all the race’s importance, it fails to receive “the type of attention it should merit,” Casillas, the Dallas County prosecutor, said. Although the judges are elected statewide, the campaigns are low profile. Several candidates list spouses and relatives among top campaign contributors. In the second half of 2013, for each dollar raised by a Republican candidate for a seat on the criminal appeals court, Greg Abbott, the party’s gubernatorial front-runner, raised about $500. Editor's note: An earlier version of this story incorrectly identified state district judge Barbara Walther's campaign manager as Gus Johnson. His name is Gus Clemens.